Need Great Motorcycle Riding Gear? Motorcycle riding gear that best suits your personal needs and riding style can boost your riding enjoyment from good fun to pure pleasure. 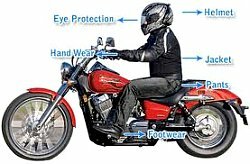 Plus, carefully selected, high quality motorcycle gear can greatly increase your riding safety and comfort. The right gear can determine if your're going to enjoy your ride or have an uncomfortable day on on the road. What I mean by "motorcycle riding gear" is specialized clothing and personal equipment you'd use when traveling by motorcycle. Motorcycle riding gear and apparel manufacturers are continually making their products more effective by using advanced materials, creating new features and improving overall designs. You have lots of riding gear styles, design options and producers to sort through. You'll do yourself a big favor by pulling together lots of information concerning your choices when searching for each piece of riding gear. Even small variations or a few added features can make one piece of gear better suited to your particular needs than another. Sure, you know your riding apparel should fit properly. But riding gear such as pants and jackets designed to work best wen you're riding a motorcycle doesn't fit the same when you're not on your bike. So when your just standing around, your gear may not seem to fit properly. A very effective way to determine if a certain piece of riding gear fits right is to see if it stays in place when you're on your bike and holding the handle bars. Motorcycle pants usually have extra material in the knees, and the legs are longer than your every-day jeans. But when you sit on your motorcycle and bend your knees to reach the foot pegs, the pants should fit just right. The sleeves on most motorcycle jackets are curved to keep the back of the jacket from pulling up after you've leaned forward to hold onto the handle bars. Many jackets are built with numerous fasteners zippers and straps on the sleeves, waist and collar to take in the slack and out the cold. You can determine closely how well a jacket will fit, feel and perform when you ride by giving it a "seat test" on a parked motorcycle before you buy the garment. The same goes for most other personal riding gear. When it comes to motorcycle riding gear, "value" is determined by the level of a product's quality in relation to how much you pay for it. Some products offer lots of important features at an attractive price. That's high value. But others may offer the same features but at a higher price. That's less value. By sorting out the brands and features, you can zero-in on products that offer the designs and level of quality you want at a price you're satisfied paying. Why pay more? Well, sometimes paying a higher price is necessary. For example, a more expensive jacket might fit you extremely well. It might offer one or two additional features that really suit your riding style or otherwise meet your needs. So you must decide if paying more for a specific product that gives you what you desire is what you want to do. Let's face it, riding a motorcycle is dangerous. I'm sure you can think of many ways riders can get hurt. In addition to wearing a high-quality motorcycle helmet in case your head hits the pavement, it's wise to wear riding gear capable of protecting the rest of your body against falls, collisions, cuts and severe abrasions. Many riding gear manufacturers do a good job of integrating effective safety features and protective materials into their products. When you're selecting gear, it's important to know what safety features work best in certain products and to determine what features you desire. Before you can select a certain type of motorcycle gear, you should decide how you'd like it to perform. For example, if you ride year-round in a region where the weather gets quite cold, you might want a single, versatile jacket that can keep you comfortable throughout a wide range of temperatures and weather conditions. Or you might go for a mid-weight jacket, then add a heated vest when temperatures drop and use a rain suit in wet weather. After considering all performance options for a particular type of motorcycle riding gear, you can decide what level of performance best suits your needs and riding style. Most motorcycle riding gear is pretty durable. However you might not intend to use a certain piece of equipment too frequently, such as a pair of rain boots. So, in this instance, extreme durability -- for you -- is unnecessary. You might make a different choice when choosing gloves or riding boots. Hey, why not buy motorcycle gear from a specific manufacturer because that brand looks good and -- just as important -- makes you look good. It's fun to look cool or to project a certain image when you're out for a ride. If you know a certain manufacturer's riding gear will perform the way you want and it has the features you want, plus it looks good, why not buy it? You have many options when deciding if you want riding gear made entirely of one material -- such as leather or man-made fabrics. And you can choose gear that integrates special purpose materials such as Kevlar or Gore-Tex into their designs. Each material offers certain advantages when used in specific types of cycle gear such as boots, apparel, personal accessories, safety gear and much more. When you get right down to it, you, personally, are the key ingredient to think about when selecting riding gear. And whatever else is important to you. Pulling info together, determining your equipment options and selecting the best riding gear for you may take awhile. Got Great Motorcycle Rider Gear? Which piece of motorcycle riding gear works great for you and really delivers the goods? Perhaps your helmet, jacket, pants, boots or gloves? Or another important piece of personal riding gear? Most motorcycle riders have at least one piece of riding gear they can depend on without question -- I know I do. Tell us about your most outstanding piece of rider gear and let us know why you'd recommend it to other riders. Entering your recommendation for a reliable piece of rider gear is easy -- just tell us here the same way you would if we were talking at the cycle shop. Give us an example of how this equipment works great for you.